This months theme for the Can Jam of apples, pears or quince had me excited to try something that brings back so many childhood memories. One of my favorite snacks as child was a simple sandwich of toast with marmelada. Growing up in a Portuguese home we always had marmelada around. It never clicked with me until a few years ago that it was very similar to Membrillo or quince paste. I was at a friends cottage this summer and he pointed out 2 Quince trees he had in his garden that were loaded with fruit. I knew that I wanted to try making my own "doce". I figured that if he was growing quince in his garden that it would be pretty easy to get some at one of our local markets. No so. I tried a few markets and when I was able to find some the price per fruit was just too high. I mentioned my search to a friend at a great neighborhood bakery that makes their own preserves, Flaky Tart and she offered to share some that she had picked at home. This made my day, I was finally going to try making my own childhood favorite. I called my mom and asked her for her recipe and as her recipes go, it was very free formed. Some of this, a fingers worth of that. The recipe was very short on time and temperature details, so I really just used it as a guide and referred to a few books for similar takes on quince paste. The color. It never got to a golden orange-y stage but the flavor was as I remembered. I also think I left it on the heat to long and it set much harder than I expected. 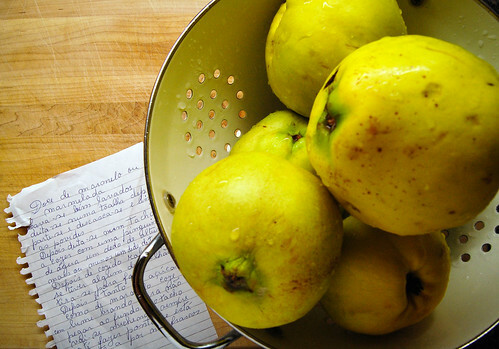 Clean the quince well and dry. Peel, core and quarter. After, place in a pot and add water as high as the thickness of one finger, more or less (one finger sideways). After it's cooked pass the fruit through a food mill. Add as much sugar as there is fruit and cook over a low heat and always stir so it doesn't burn on the bottom. When it's ready put it in jars.